Primary classroom displays for the 6 traits range anywhere from Clifford with six dog dishes to underwater scenes with six different sea creatures representing the traits. When you're working with kindergarten through 3rd, you can get away with almost anything! But what about the upper grades? You still want to keep the 6 traits in front of your students, especially when first introducing them. And, once they know the traits, you want them to remember the important points for each one. Here are some ideas that might help you in upper elementary classrooms through high school and into college. Allow students to create the trait display. As you introduce each trait, ask students to take notes on the main points involved with each. If you introduce a trait each day for six days, then on the seventh day, divide the class into six groups and assign one trait to each group. Have each group create a poster for the assigned trait. Allow them to choose from a variety of decorative options (or simply provide poster board and markers), then have groups present their displays one at a time. 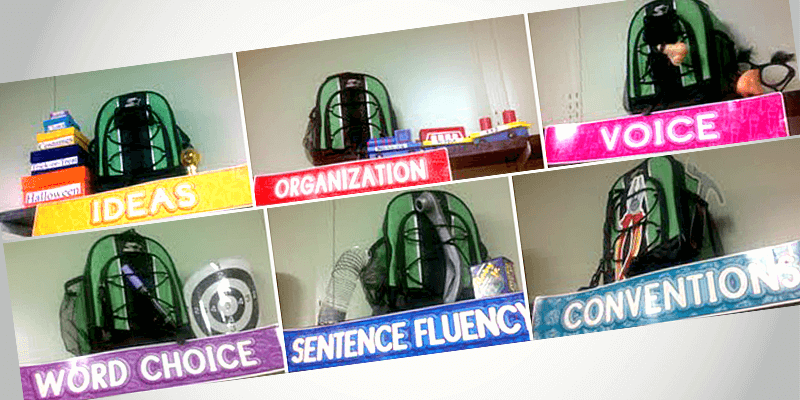 Hang the finished products to help students remember the basics of the traits. If students mention later in the year that they want to add to the display, that's great! If your school has emphasized 6-traits writing for several years, you might want to try a 6-traits tag-team review! Using six colorful poster boards, write a trait on each and place the posters at six different stations in the classroom. Ask students to form six groups, placing one group at each station. Set a timer for two minutes. Ask each group of students to list as many main points as they can for the trait at their first station. As the time runs out, have students rotate to the next station. For each station after the first, set the timer for one minute. Continue until all groups have visited each trait station. Collect the posters as a pre-assessment piece. You'll know what they're missing right away and can address those specific gaps as you review the traits. 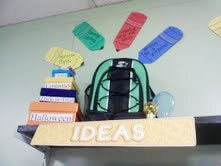 West Vigo Middle School (Terre Haute, IN) teacher Melanie Beaver utilized a shelf to display her 6 Traits with backpacks and objects to visually remind students of the significant lessons and skills. 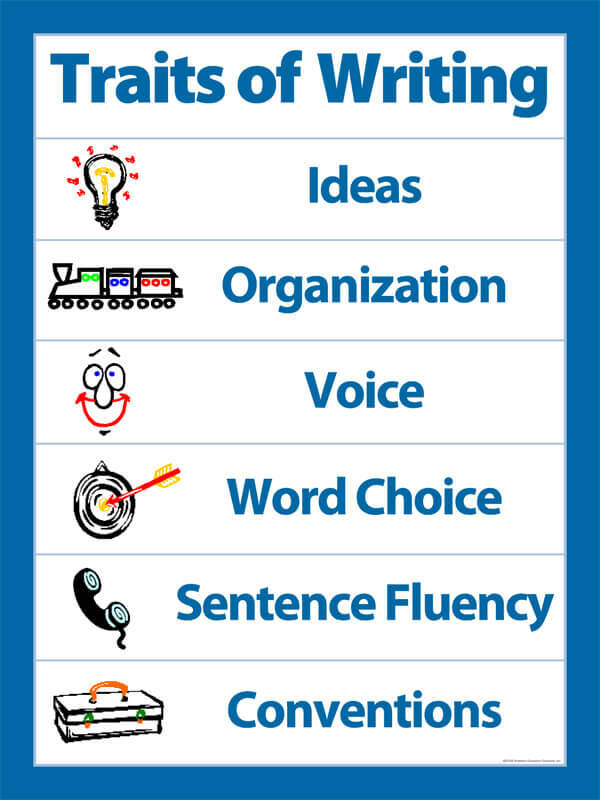 For something simple, try my Traits of Writing poster. It comes conveniently folded for storage but can easily be laminated to make it last. Hang it up in your classroom writing center or display it on a wall where students can refer to it for the trait words and icons. The Smekens' icons act as triggers for the main points of each trait. To take the poster a step further, laminate it and cut it up to create headings for the traits. Then, as you provide a mini-lesson for a trait, type up a key word from your mini-lesson to stick with the heading. You could use sticky notes or staple strips of colorful paper to the headings. This type of display becomes a chronicle of mini-lessons. If you include enough information, you can refer to it later when mini-conferencing with students. Take a student back to the display and remind him of a mini-lesson you did weeks before that perhaps he is just ready for now. Whatever you do, don't neglect to have the traits on display in the upper grades. It offers you the opportunity to refer to the traits with a visual reminder. It also lets students know that you feel the traits are so important that you give them wall space! I am an instructional coach in two different buildings in my corporation. After holding Six Traits trainings for all elementary teachers in our system, the other four coaches and I introduced the traits into each classroom. We encouraged teachers to put up a working bulletin board in their classrooms. Most teachers did this, but one grade level provided a hallway "bulletin board" that I thought was a great reminder and a unique display. In the third grade wing of Parkview Intermediate, where four classrooms share a nook, the teachers worked together to put up an ice cream themed bulletin board as a constant reminder to their students of what great writing includes. Within their classrooms, they have bulletin boards that have been added to throughout the year with the skills under each trait. I loved that the teachers wanted to encourage the Six Traits outside the classroom as well by taking advantage of a hallway board.